A local museum in the regional town of Carpi, Italy, near the Fossoli transit camp memorial site and associated with it. Though it isn't very big and everything is in Italian only, it's a worthwhile combination to consider. More background info: for general background see under Shoah Memorial, Milan, and Fossoli. The museum, whose full official name in the original Italian is Museo Monumento al Deportato, was established in 1973, in collaboration with an association of survivors, called ANED (“Associazione nazionale ex deportati” – 'association of former deportees'). It is administratively run together with the Fossoli camp memorial under the umbrella of the Fondazione Ex-Campo Fossoli. 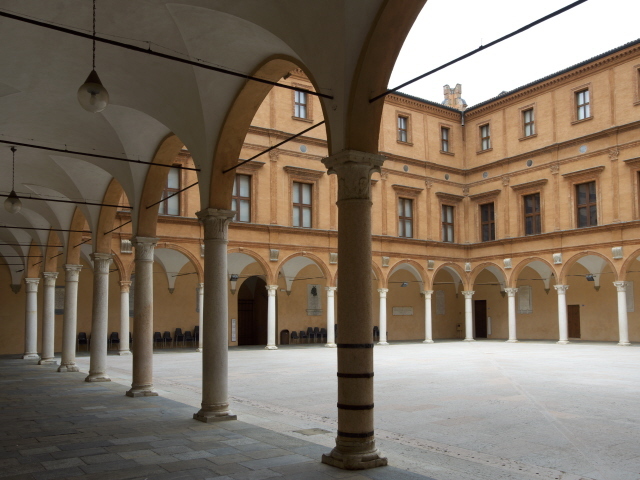 The museum is housed in the fairly grand old Palazzo dei Pio right in the centre of the town of Carpi in the Emilia-Romagna region (see also Bologna). Apart from its place in history with regard to the Holocaust and Nazism in WWII the town is also noted for its role in the resistance against the German occupation. In May 2012 an earthquake struck the region. The epicentre was just a few miles from Carpi and the town itself suffered some structural damage, including Palazzo dei Pio itself. But when I was there in May 2015, hardly anything of the damage was still visible to the untrained eye (but you could spot new metal strengthening elements on the colonnades nearby that were installed after the earthquake). What there is to see: When you've found the courtyard that the museum entrance is located in you can first view the outdoor memorial stelae. These are grey concrete slabs (vaguely reminiscent of the sections that the Berlin Wall was composed of). On these slabs are carved the names of various places associated in one way or another with the history of the Holocaust and deportations. The names are spelled in such a way that the line breaks are random, which makes it sometimes difficult to discern the places. There are also a couple of proper spelling mistakes. But mostly I couldn't identify them because I simply hadn't ever heard of the names before. All the usual suspects, however, were there too, including the names of the main concentration camps (e.g. Natzweiler, Neuengamme, Maut[h]ausen, and, of course, Fossoli). Inside, the museum exhibition is spread out over 13 rooms of different sizes. What there is to see is a mix of classic exhibits such as documents and artefacts as well as quite a significant amount of artwork. And the latter is really what sets this museum apart. The first room is already dominated by its large-scale wall murals depicting skinny, skeleton-like concentration camp inmates standing tightly packed together (for roll call?) with hollow holes for eyes … really quiet spooky. In addition to yet more such artwork, some of the displays are also more abstract and artfully presented rather than the typical information-driven museum exhibits. For instance there is a glass display cabinet with soil and an urn from Dachau. More overtly telling items on display include photos – e.g. of the Todesstiege at Mauthausen, crematoria, Zyklon-B gas canisters, or of the infamous 'Arbeit macht frei' slogan familiar from several concentration camps (cf. Auschwitz, Sachsenhausen, Terezin, etc.). Also present are of course images of Hitler, Himmler and, naturally, Mussolini. Furthermore, there are a few documents such camp plans (e.g. of Buchenwald) or Nazi “Bekanntmachungen” (public notification posters). There are only few original artefacts on display here, but these include badges and inmate numbers as well as personal belongings such as spoons, belts and one full camp uniform. The last room is a large vaulted hall of names. These names are etched onto the hall's columns and the outer walls are, again, ringed by (quoted?) words. Otherwise this hall is completely empty – just a room for reflection. To get back to the entrance you have to retrace your steps all the way through the entire exhibition. Back at the reception area you can cast a glance at the books and brochures available here, but I didn't spot anything that wasn't in Italian only. Overall, this museum may not be best suited to foreign visitors, given its strictly monolingual Italian-only commodification, (unless you're on a guided tour – see below) but there's still enough to make it worthwhile for a short visit in conjunction with going to Fossoli. Location: right in the very heart of the old town centre in the Palazzo dei Pio, on the eastern side of the Piazza dei Martiri in Carpi, Emilia-Romagna region, northern Italy, some 10 miles (16 km) north of Modena and ca. 30 miles (50 km) north-west of Bologna. The entrance to the museum is in the courtyard between Piazza dei Martiri and Piazzale Re Astolfo (with its Santa Maria church and tower), and NOT at the Fossoli Foundation's official address at 57, Via Giulio Rovighi (presumably that's just where the office is). Access and costs: a bit off the regular tourist trails, but not too difficult to get to; fairly inexpensive. Details: Getting to Carpi is easiest by car, but there are also train connections, especially from nearby Modena. From the train station on the eastern edge of the town it's less than a 10-minute walk to the museum (up Viale Dallai Darfo leading straight to Piazza dei Martiri and then left/south). Parking can be a bit difficult to find in town, so you may end up having to walk even further from your spot to the museum. There's no parking at all directly at the museum. And most town-centre parking is metered (but free on Sundays! … as I was belatedly informed by a helpful local just after I had inserted my coins according to the instructions on the machine). Opening times: Friday to Sunday only (and on public holidays) from 10 a.m. to 1 p.m. and 3 to 7 p.m.
Time required: as little as ca. half an hour – but probably longer if you can read Italian. Combinations with other dark destinations: The most obvious and important combination has to be that with the site of the former Fossoli transit camp north of Carpi. Much closer by, in the courtyard just north of the museum, are plenty of memorial plaques honouring various “martyrs”, not only of the sort also commemorated in the museum but also from earlier periods. Right on Piazza dei Martiri, the martyrs of the resistance against the Nazis in WWII have their own special memorial. Also to be found in Carpi are the former synagogue and the town's small one-street Jewish ex-ghetto. Local guided tours can combine all these sites in ca. 2-3 hours (costs ca. 100 EUR +), and are apparently also available in English. 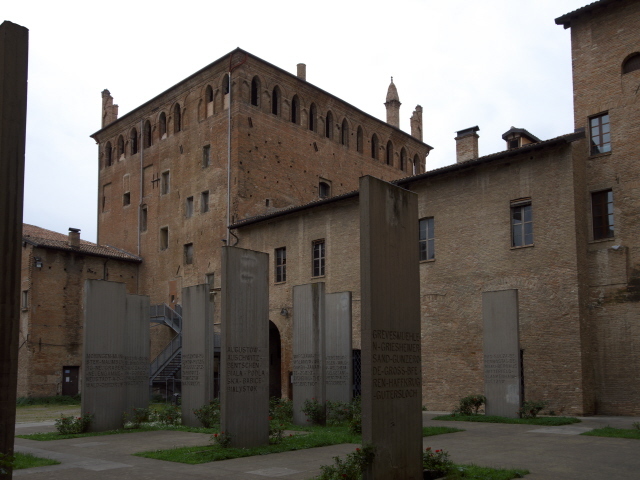 Further afield, Bologna is the next larger conurbation and it has a couple of interesting dark sites to offer too, especially of very different categories, though. More thematically related is the impressive Shoah Memorial in Milan, a few hours' drive to the north-west. Combinations with non-dark destinations: Lying within the Padan plain, the landscape around Carpi is flat and rather featureless compared to many other parts of Italy, but the little town centre is quite pleasant and quaint, in that provincial small-town kind of way. If you'd like it grander go to nearby Modena or further still to Bologna. The Adriatic coast isn't too far either. An unusual tourist attraction in Modena that some people may be especially interested in is the famous Ferrari museum (personally, though, sports cars leave me as cold as can be, so I wasn't in the slightest bit tempted to go there myself … somehow I seem to lack that specific male gene …).